Hippychick sent me a fabulous selection of baby products this week to review. They are an innovative company aiming to ‘sell the products you never knew you needed but can’t live with out,’ Let’s see what you think. First up is the Totseat, as modelled by my lovely tester Harry (nearly 1) This was pretty simple and speedy to set up and fitted well to my rather odd shaped chairs, It folds down into it’s own tiny bag which easily pops in a nappy bag and how convenient is it to have a high chair with you wherever you go. Saves you having to pop your child on your knee when you are having a drink or eating your lunch and your child can feel they are properly joining in.Harry was completely relaxed sitting in the totseat and looked really comfortable. He dropped his toy at one stage and pulled to the side to retrieve it and he was totally secure. A big hit and his family are delighted. It washes, transports and does the job . It comes in 7 colours, costs £24.50 and is suitable for babies/toddlers 9-30 months. Fantastic. From Hippychick also comes the Hipseat, a back supporting belt that helps you carry your child comforatbly. It supports you spine and can help prevent damage to the back and is recommended by health visitors, physiotherapists and and osteopaths. Again it is machine washable, durable and hardwearing, it also comes in a myriad of colours. It has a great foam shelf a child can comfortably sit on and a little pocket for your keys etc. Both these products have won awards from Practical Parenting . For £39.95 it may sound pricey but I recently had to have a massage for backache that cost £40 for the hour. I think good carrying systems really are an investment. Also from Hippychick I received a bed protector for a cot bed . The one we had before was rustly and lumpy and bumpy under my daughters sheets. not pleasant for her. This one is totally different. It is soft, breathable absoprbnat waterproof and smooth. It hads 2 layers of brushed cotton sandwiching a thin layer of polyurethane ait also protects against dustmites. It can be washed in the machine at 60 and tumble dried. It can go above or below a bottom sheet and it is very discreet. A great solution. Again this won gold in the Practical Parenting 2010 awards. 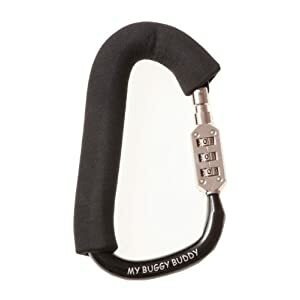 We have been sent My Buggy Buddy lock . It locks up your buggy to stop it being pinched. So important so clever and so simple. Where I live many cafes now ban buggys or prams due to health and safety. Our local health centre also insist you lock your buggy outside and this device is just perfect. Its just not worth the anxiety of leaving an expensive buggy unlocked, For just £8.95 this could save you a fortune. 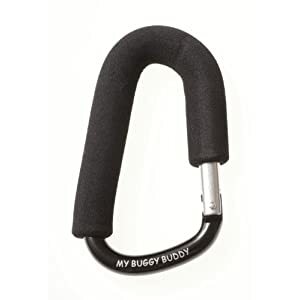 Also available are these great buggy clips for when you don’t have a handle on your buggy. I had a Quinny pushchair and this would have been just perfect. At £5.99 this is an inexpensive solution to what can be a tricky problem – how to carry your shopping and push your buggy. It is foam covered to prevent marking, super strong and just does the job clipping your bag onto your buggy. I like simple, stylish solutions don’t you! My tester and I found these products really useful. I absolutely LOVE the hippychick hipseat and used it for about 18 months with my second baby Ruby. I suffered with a bad back since my first pregnancy and my chiropractor recommended this product. I would use it even if I was carrying her from the car into the house, or up the stairs, or just around the house. I wrote to Hippychick and told them what a lifesaver their product was and they very kindly sent me one to use in my baby classes. I have one there for mums to use or try out before they buy. Fab! Oh thats a brilliant idea Jen..they are pretty fab aren’t they! We’ve travelled quite a lot with our children including six weeks in Thailand on our way to Australia (where we’re living now), the Totseat looks perfect for travelling families. We have something similar and it’s a godsend, although the Totseat looks much more compact; it’s on our list for the next time we’re on the move with little ones! Thank you.